English is probably one of the most widely used language in the world, which many said is the first global lingua franca. However, spelling, punctuation, grammar, and style of English language has been problem for many native, not to say non-native English speakers or writers. Just imagine if you’re writing a business document in English, using incorrect, misspelled, or incomprehensible English, and face the consequences of wrong interpretation, or worst, failing to clinch a contract or sales. With the help of WhiteSmoke 2009, everybody can writes better and has perfect English style. WhiteSmoke 2009 is an innovative proofreading and editing tool that helps author and writer to compose well–written emails to family and friends, create professional results for business and corporate settings and linguistically correct essay and etc. WhiteSmoke 2009 has the featured language tools of Grammar Checker, Style Checker, Spell Checker, Punctuation Checker, Dictionary-Thesaurus, Letter Templates, Error Explanations, English Lessons, AutoCorrect and Notifier and Everywhere. 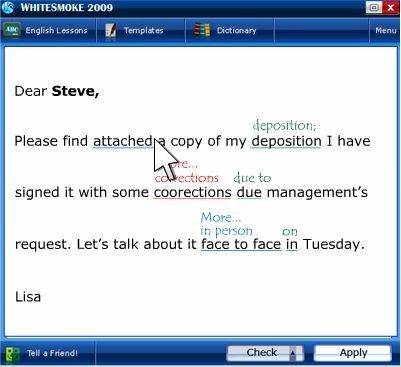 WhiteSmoke 2009 features include ability to detect error in spelling, fix incorrect contextual (real-word) spelling, insert missing auxiliaries, insert missing determiners, insert missing prepositions, insert missing nouns, insert missing copula (be), insert missing words in set phrases, subject-verb agreement, auxiliary-verb agreement, determiner-noun agreement, preposition-verb agreement, fix tense by context, fix aspect by context, delete redundant words, monitor capitalization, fix incorrect punctuation (run-ons, sentence delimiters, commas inside sentence, comma after introductory phrase, comma after prepositional phrase in the beginning of the sentence), substitute coordinating conjunctions in sentence beginnings to appropriate sentence connectors, offer alternative wording to whole phrases for varied writing style, and has enrichment. WhiteSmoke writing software general version product with General Writing style costs $79.95. While the professional version for Business Writing, Hi-Tech Writing, Creative Writing and Bio-Medical Writing costs $99.95 each. However, there is always plenty of hot offer aka promotional discount going on on WhiteSmoke website, where interested party can buy a copy of WhiteSmoke at cheaper price, sometimes at up to 75% off.